With SEMA 2015 fast approaching Tuesday — and some events even start Monday — the Specialty Market Equipment Association offered a few last-minute tips worth reviewing for attendees and buyers in the latest SEMA News. 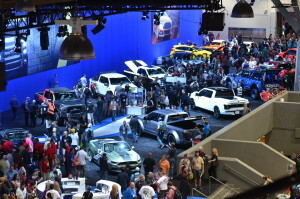 The New Products Showcase has been moved to the bridge between the Central and South Halls in the western Las Vegas Convention Center and granted extended hours, SEMA noted. SEMA also pointed to the Featured Product section of the Showcase, which also includes older “high-volume, innovative products that would be of keen interest to the industry,” according to SEMA News. Buyers can use SEMA Show scanners and the updated SEMA app to make a shopping list. Christmas is coming up, after all. 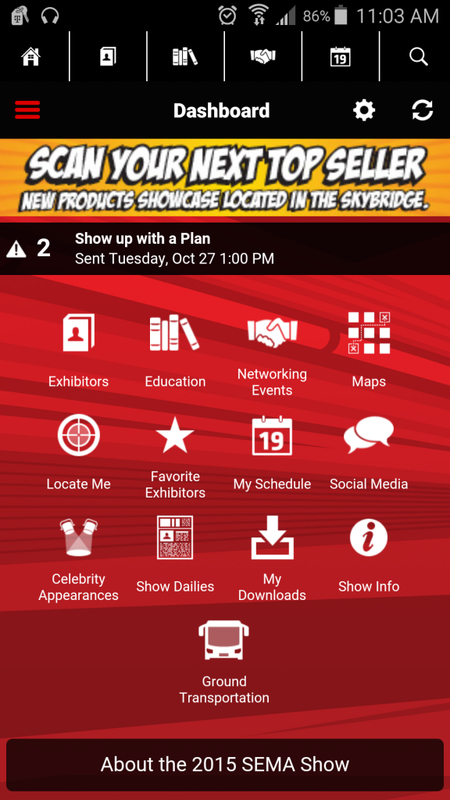 The SEMA Show app’s 2015 update (get it here) retains features like turn-by-turn directions and current exhibitors but adds the product-scanning capability. Custom exhibitor bookmarks and mapping of the most efficient route to see them all. Amid a sea of vehicles, find where the actual shuttles back to your hotels are located. Get SEMA Social Media updates. An area south of the Las Vegas Convention Center will host the debut of the Performance Pavilion, one of four locations intended to spotlight some of the 500 new manufacturers this year at SEMA, according to SEMA News. Other expansion zones include the upper level of South Hall, Grand Lobby meeting rooms (Rooms N100-N120) and the Westgate Pavilion in the Las Vegas Westgate, according to the publication. SEMA News encouraged attendees to take advantage of one of the educational options, including 50 free sessions, which run Monday through Friday. Details: www.SEMAShow.com/education. SEMA News also gave a plug to the Society of Collision Repair Specialists’ OEM Collision Repair Technology Summit, part of the Nov. 3-6 Repairer Driven Education series. Besides the OEM Collision Repair Technology Summit, the Society of Collision Repair Specialists also offers the Repairer Driven Education Series, which draws thousands to its sessions on automotive technology and best business practices during SEMA. Register online now, at the SEMA registration area at the Westgate Las Vegas or outside the RDE venue of Rooms N231-N241 at the Las Vegas Convention Center North Hall. More information available here. Trade shows can be notorious for members clearing out early, but SEMA News cautioned that “smart buyers” know to stay through the end of Friday. He also told the publication that half of the 60,000 buyers stay for Friday, and all exhibitors are slated to stay until 4 p.m.
We’d also remind attendees that Friday is the deadline to enter the SCRS $11,000 rivet gun SEMA giveway. The XPress 800 pneumatic-hydraulic universal rivet gun, provided by Reliable Automotive Equipment, was already sanctioned by Tesla and Mercedes for work on their vehicles. Now, it’s one of the first — if not the first — rivet guns approved for the mixed-materials Cadillac CT6, which will require shop certification to work on the car.